SACO created the tallest media facade on the planet at Burj Khalifa in Dubai, UAE, using its innovative V-Stick technology. Emaar Properties Dubai, the premiere real estate developer in the UAE, and owner/operator of Burj Khalifa, the tallest building in the world, created an initiative to light up the East façade of the iconic tower and give it high resolution video capability across the entire height of the tower. Emaar tasked SACO to design and create a system that would seamlessly integrate within the architecture of the building. The initiative was to replace the existing temporary system with a permanently mounted system that is comprised of the very latest in LED technology and video processing. The new permanent SACO system has 20x more resolution than the previous system and extends all the way up to 770 meters of the 828-meter structure. In order to address the parameters, constraints and 7-month deliverable timeframe of the project, SACO had to rethink how to approach the challenge. In order to remain efficient and respect the short timeframe, SACO’s Architectural division sourced and created state of the art parametric tools, which they used to calculate the layout of every component on the façade, including cable path and links, and control room layouts. Using machine thinking allows SACO to resolve complex problems in a very short period of time. In addition, the system then integrates with SACOs “Health Check” monitoring software and tracks and logs as-built conditions, real time changes as well as future servicing. This system not only contributed the speed of execution of the project, but also allows SACO and Emaar to get real time feedback on the health of the media system. To address the physicality of the installation, SACO rented 2 warehouse facilities close to the Burj Khalifa and recreated the SACO Montreal workspace for assembly of final components. In order to maximize the timeframe, all technology was manufactured in Montreal and shipped to Dubai, however extrusions and other static components were sourced and manufactured locally in Dubai. The level of quality materials available in the UAE is very good. SACO sent over assembly staff as well as worked with its local partner, 3S, to perform final assembly, quality control (QC) and testing in the Dubai workspaces. Having dedicated local facilities and staff also allowed SACO to react quickly to any as-built condition changes. Another challenge was how to attach the SACO V-Sticks and carrier to the fin detail of the building without covering the actual architectural fin. One of Burj Khalifa’s many features is the incredible shine that comes from the polished stainless steel architectural fins that run the length of the building. To add to the challenge, drilling into the fin was not permitted. To resolve this condition, SACO designed a special stainless steel bracket that hugs the fin and clip on its back edge. In order not to affect the “shine” of the architectural fin, the bracket was polished to match the finish of the fin. 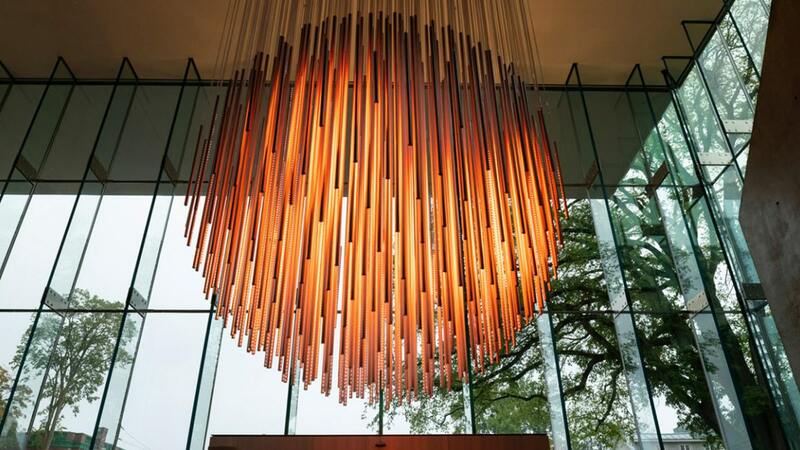 The result is a seamless linear feature that disappears until the lights are turned on. Burj Khalifa has a very interesting geometry, and viewing angles needed to be carefully calculated to provide the best view from around the building, but at the same time needed to not be disruptive to the residents and hotel guests of the building. In order to address this challenge, SACO designed 6 different carrier angles for its V-Stick. The result is a clean, non-disruptive installation that will achieve its mission for the years to come. Moving items and gear throughout the building was a logistical puzzle as this had to be accomplished without affecting building operations. So careful planning with the client was key. The physical installation on the facade of the building was fully done using rope access specialists and every piece of equipment was manoeuvred in place and installed by skilled teams working on the side of the building. 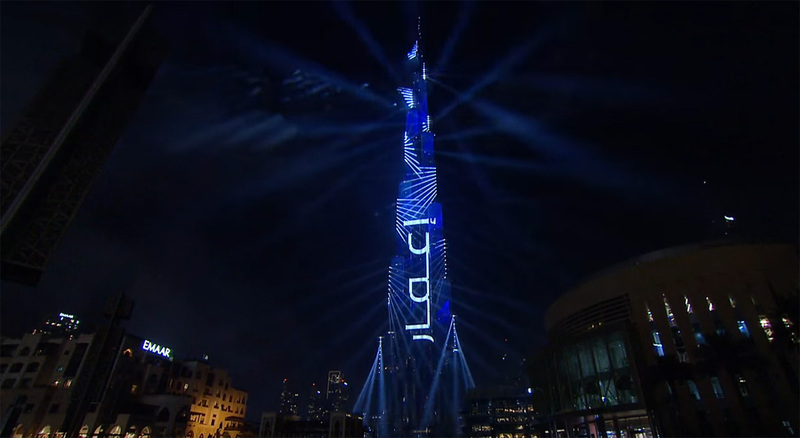 In addition to the design, manufacturing and installation of the new Burj Khalifa media facade, Emaar also contracted SACO’s media division, SACO MEDIA COLLECTIVE, to design and create bespoke content as part of the Burj Khalifa daily shows. SACO MEDIA COLLECTIVE was created to bring the best creators, artists and producers together in collaboration with SACO’s production management team with the intent to deliver incredible immersive digital content and storytelling for large-scale live and architectural projects. 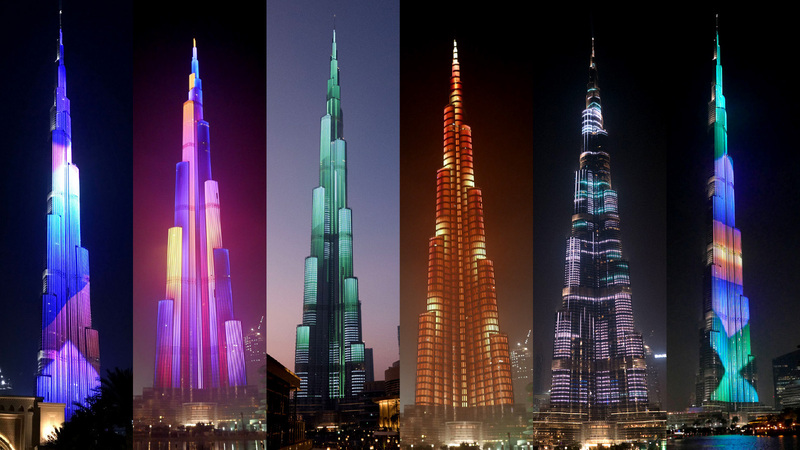 SACO is also responsible for the operation and the well-being of the Burj Khalifa screen for the next 5 years. “SACO is a 360-degree company. It’s important for us that our clients know that we are there to support them before, during and after. This is one of the important aspects that the Emaar and SACO teams discussed, and we are very proud of what we have achieved together,” says Yanick Fournier, Vice-President of Sales for SACO. SACO Technologies Inc. has always been a visionary company built upon its leading R&D and manufacturing expertise. With corporate offices worldwide, our team boasts over 30 years of experience. SACO has become the technological leader and go-to company in both indoor and outdoor LED Solid State Lighting and Media Solutions.